Richard King is a freelance writer based in Fremantle, Australia. He writes regularly for the Australian and the Sydney Morning Herald. Half a century later, the world is full of Catch-22s. 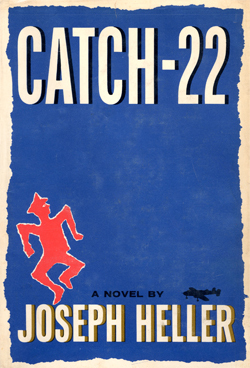 On November 11, 1961, readers of the New York Times were confronted with a huge advertisement for a novel, published the previous day, by a little-known writer named Joseph Heller. Running from the top to the bottom of the page and covering five of the paper’s eight columns, the ad showed an angular, panic-stricken figure, apparently in military uniform, in flight from some unspecified threat. “WHAT’S THE CATCH?” the caption screamed – a reference to the novel’s title, which, in itself, threw no light on the matter. Readers would have to buy the novel and work their way through 50-odd pages in order to find the answer to that question. I dare say it was worth the effort.